Bells has always known that our most important asset is not the machinery, products or even beautiful location, but that it is our people that make the business what it is. We are committed to recruiting local talent and seeing them flourish through both on-the-job and classroom training. Many of the management team today began as young apprentices and this is the legacy we want to continue for many more generations to come. We offer Level 2 and Level 3 Baking Apprentices to our young people working on the Bakery lines to help them to progress their skills, personal development and importantly to climb the career ladder. We also have Engineering Apprentices including a L3 Diploma in Engineering, who work alongside our experienced team in-house engineers. Could this be you? Do you want to know about our Apprenticeship schemes and if they are right for you? During my teenager years in Dumfries I was a keen footballer and progressed to a level where I actually had the opportunity to take part in football trials with Carlisle United. However, I decided that I wanted to pursue a career in the Police Service. Nevertheless, to join the police you needed to be 18 years old which meant that I had 2 years to wait before I could apply. It was during this period that I saw an ad in the local paper for production assistants at Bells of Lazonby, I applied and got the job which was only meant to be a stop gap until I could join the Police Force. At the time I was told that I wouldn’t last – 28 years later, I’m part of the fixtures & fittings. After being made Team leader at 18 years old, I was quickly promoted to nightshift manager at Bells, this made me one of the youngest managers and I haven’t looked back since. From there I progressed to Free-From Factory Manager and for the last 7 years have been Operations Manager. The highlight of my career so far was meeting the Queen at Buckingham Palace upon achieving the Queens award for Innovation back in 2003, after my team successfully implemented a new production system to boost efficiency in the Bakery. I saw a job advert for Bells and decided to go for it. I was successful in my application and a little while after working here, Bells were impressed with my initiative and I was asked whether I wanted to join the Level 2 Baking Apprenticeship scheme. At Level 2 we learnt traditional baking with a tutor from Kendal College, which after being shown a demonstration, was very hands-on and practical. We also learnt health and safety legislation which has been really useful for working around the Bakery. I work in the dedicated free-from bakery so everything I make on the course is gluten, wheat and dairy free. So far I have made a gluten free carrot cake mini loaf and a raspberry crunch mini loaf cake. Moving up to Level 3, we are more responsible for our own designs. We recently went on a trip to Manchester which allowed us to explore the current trends and helped us to think of flavours to use in our NPD. Being able to see the new products that I have designed rolled out into the factory is the highlight of the course. I feel really trusted by Bells and I am really eager to show them what I can do. I also really like the theoretical side of the programme and have been given some work experience in the technical and nutritional departments to see if this is something I would like to do in the future. I stumbled upon this opportunity when I was looking for employment. I love the fact that no two days are the same at Bells with the variety of work we are involved in – anything from creating new machinery to maintaining our fleet of vehicles. I have been working on manufacturing, welding and fabrication. I attend Kendal College one day a week which is 50/50 practical and theory based knowledge. Being in the workshop around the more experienced engineers helps me to apply theory directly to the job. 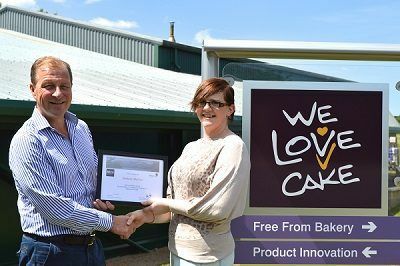 Recently, I have been involved with a project where we were launching a new type of loaf cake for one of our customers and needed to adapt some existing machinery to make this happen. I welded existing materials and crafted them into something new to make some tooling for the new products. You have to think on your feet quite a lot at Bells and there is always problem solving to be done, but that’s what keeps it fresh and exciting!